Purchased from the funds of Captain H. B. Murray's bequest. 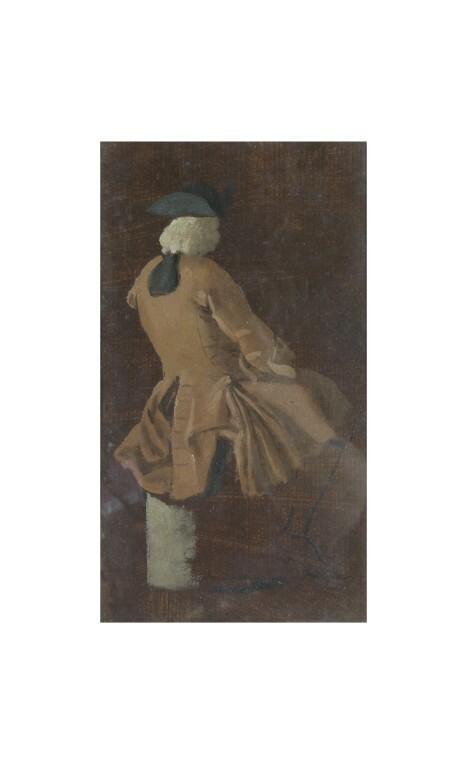 This is a study of a seated man, wearing a pale brown longcoat, wig, and tricorn hat, seen from behind. It is one of Carlevarijs’ studies known as macchiette, the quick sketches he made with daubs of colour to indicate animated Venetian figures. Carlevarijs first drew the figures on paper, copying them from people he saw in the streets and then transformed them into lively oil sketches, such as this one, which represent a crucial part of his artistic process. Studies such as these would ultimately form part of a Venetian veduta or prospect painting, which is a genre Carlevarijs is generally credited with establishing in the eighteenth century. He populated his vedute with elegantly posed and well-dressed figures, concealing the decline of the Republic under the splendour of the pageants, festivals and regattas he often represented. Carlevarijs' sketches also demonstrate his great influence on Canaletto, whose figures and their arrangement often show a marked debt to the older Master such as in Venice: The Feast Day of Saint Roch ca. 1735 (National Gallery, London, NG937). A seated man, wearing a pale brown longcoat, wig, and tricorn hat, seen from behind. This work is part of an album of fifty-three sketches by Carlevarijs which includes figures and objects he appears to have painted in the open air in preparation for insertion into formal compositions. 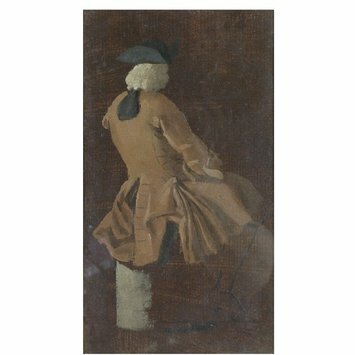 Historical significance: This is a study of a seated man, wearing a pale brown longcoat, wig, and tricorn hat, seen from behind. It is one of Carlevarijs’ studies known as macchiette, the quick sketches he made with daubs of colour to indicate animated Venetian figures. Carlevarijs first drew the figures on paper, copying them from people he saw in the streets and then transformed them into lively oil sketches, such as this one, which represent a crucial part of his artistic process. 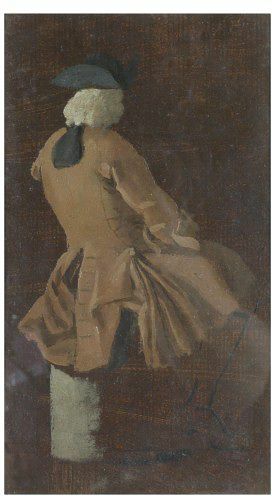 Studies such as these would ultimately form part of a Venetian veduta or prospect painting, which is a genre Carlevarijs is generally credited with establishing in the eighteenth century. He populated his vedute with elegantly posed and well-dressed figures, concealing the decline of the Republic under the splendour of the pageants, festivals and regattas he often represented. Carlevarijs' sketches also demonstrate his great influence on Canaletto, whose figures and their arrangement often show a marked debt to the older Master such as in Venice: The Feast Day of Saint Roch ca. 1735 (National Gallery, London, NG937). John Pope-Hennessy, 'A Group of Studies by Luca Carlevarijs', The Burlington Magazine for Connoisseurs, Vol. 73, No. 426 (Sep., 1938), pp. 126-131. Anon., 'Early Venetian Costume Studies' in Listener,22 September 1938, p. 613. M. Levey, Painting in XVIII century Venice, 1959, p. 79. A.	Rizzi, Disegni, incisioni e bozzetti del Carlevarijs, Exh. Cat. Udine, 1964, pp. 53-7, figs. 113-20. The Glory of Venice : art in the eighteenth century. Jane Martineau and Andrew Robison (eds. ), Exhibition held at the Royal Academy of Arts, London, September 15 - December 14, 1994 and at the National Gallery of Art, Washington, D.C., January 29 - April 23, 1995. pp. 93-97, 443-444, no. 21. Life in XVIII century Venice, Iveagh Bequest, Kenwood, 1966. A. Rizzi, Luca Carlevarijs,1967, p. 97 f., figs. 1-53 (Bozzetti). Isabella Reale and Dario Succi, Luca Carlevarijs e la veduta veneziana del Settecento Exh. Cat., Milano : Electa, c1994. Venice, 1700-1800: an exhibition of Venice and the eighteenth century (The Detroit Institute of Arts [and] John Herron Art Museum), 1952, pp. 9-12, 23-26. Luca Carlevarijs, Le fabriche e vedute di Venetia Exh. Cat., Venezia : Marsilio, 1995-1996. Charles Beddington, Luca Carlevarijs : views of Venice Exh. Cat. (San Diego, Calif.: Timken Museum of Art, c. 2001), p. 19, fig. 17. Victoria and Albert Museum, Department of Engraving, Illustration and Design and Department of Paintings, Accessions 1938, London: Board of Education, 1939.